The Ultimate Fly Fishing Guide - Avid Fly Fishermen Share Tips & Advice For Choosing The Best Fly Fishing Gear, Personal Fly Fishing Tips, And Fly Fishing Basics - Real people. Real experiences. Real helpful. You may find it confusing when choosing fly fishing hooks the first time. However, the type of fly hooks you use are very important. Here’s what you need to know about fly hooks — both freshwater hooks and saltwater hooks. Whether you’re looking for fly fishing videos for beginners or an inspirational fly fishing video or two, we’ve got ’em all here! Brook Trout, a variety of salmon living in clear, cool streams in the eastern U.S. and Canada, are a favorite of fly fishermen. These 6 tips will make your Brook Trout fly fishing trips even more successful! Fly fishing line is completely different from other types of fishing line. When fly fishing, the line weight carries the fishing fly — which is almost weightless — to the water. That’s why things like line weight and tapers are important. The saltwater flies you choose will depend on whether you’re fishing offshore, in shallow-water flats/estuaries/mangrove jungles, or on the ocean floor. Here’s how to take better fish pictures on your fishing trips. Simple tips showing you how to pose the fish and use a few simple settings on your camera. You don’t need to be a professional photographer to take great fish photos. And you definitely don’t need to settle for lame grip-and-grin photos when you go fishing! 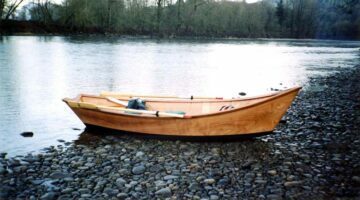 Soldotna Alaska fishing and camping tips for those thinking of traveling to Alaska to fish the Kenai River. 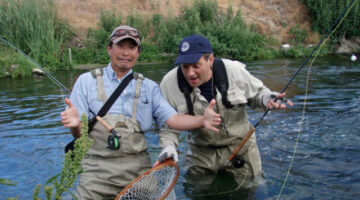 The area is known for its superb salmon fishing. Here’s a long list of fly fishing destinations, including fly fishing guides, lodges, trip planners, and travel experts. Everything you need to know to plan and prepare your next fly fishing trip. Some kids begin fly fishing as young as 5, while others may not be ready until they reach their teens. First, you need to have the ability to recognize your child’s development skills. And you need to be keenly aware of the moment when fly fishing is no longer fun for them. 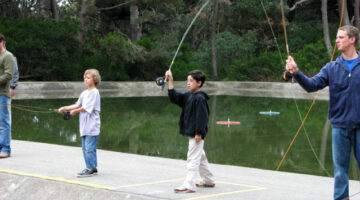 Some kids may only be able to handle 10 minutes to a half hour of fly fishing before they become bored or frustrated. Some kids are ready to learn fly fishing basics when they are 7 or 8 years old. Others will need more time and may be as old as 12 or 13 before they’re ready to experience their first fly fishing adventure. Here are some tips for teaching your child to fly fish for the first time.